3rd April 2019: Intertrust Ireland today announced the launch of their fund administration business, complimenting their existing fund service offering in Ireland. Intertrust will now provide administration services to both Irish and non-Irish domiciled collective investment schemes (including the performance of valuation services, fund accounting services and acting as transfer agent or registration agent for such funds), specialising in alternative investment funds. The launch of their fund administration services allows Intertrust’s global private equity, private debt and real estate clients to delegate their back office accounting and investor relations operations to the Irish based business unit, the firm says. Last July, Intertrust announced the expansion of its activities to include aircraft ABS administration,and the creation of 60 new jobs. 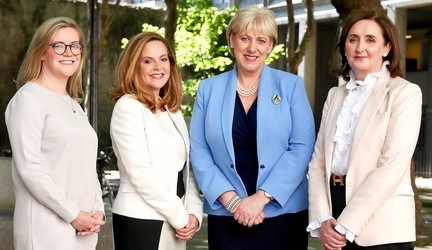 At the announcement were (from left): Fiona McCabe, International FS Project Manager, IDA Ireland; Anne Flood, Head of Capital Markets, Intertrust Ireland; Heather Humphreys, Minister for Business, Enterprise & Innovation; and Imelda Shine, MD, Intertrust Ireland. Intertrust Ireland has appointed Kevin Doyle as the Head of Fund Administration to lead the new business unit, and it is anticipated that additional staff will be recruited in 2019 to support the future growth of the business. Doyle has 15 years’ experience in fund administration and joins Intertrust from HedgeServ where he was responsible for a number of clients across various strategies, asset types and structures.